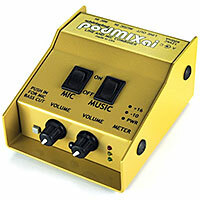 The Whirlwind podMIXai is an active mixing device that combines a dynamic microphone with an unbalanced stereo audio source for connection to a single line level input of a sound system. Use it with CD and MP3 players, computer sound card outputs, DJ mixers, etc. along with a microphone in sports arenas, conference rooms, banquet halls, gymnasiums and party houses for paging or announcements over background music. The output is mono balanced line level.